We set out on our adventure along the Kennebec River at the Summer Solstice looking for locations where we could install the pinhole cameras for the Solargraph project. There were so many places along the river in Norridgewock which had vantage points that were very good compositions, especially right in town where the railroad bridge crosses the river. I saw perfect scenes, then found getting cameras duct taped to trees which focused on them proved difficult. The banks of the river are very steep. Sites that look navigable proved too dangerous to attempt, especially considering we set out after heavy spring rains and the runoff from the mountains made the river high and roiling. I didn’t want to end up jammed into the sluiceway of the dam downstream. So we left downtown Norridgewock with no cameras in place and headed along the river toward Madison. 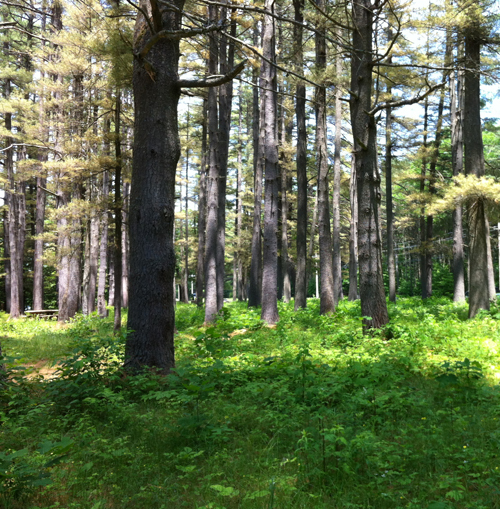 The dense woods along the road opened up to a stand of white pines. We stopped to investigate and discovered a very special place. May your visit encourage further reading about this site to discover knowledge about the Wabanaki people and their great skills at peaceful living with wild nature. The Wabanaki people gather every August at this site for Mizi Negewet kamigwezoi (Families Gathered Together) to remember Nemikkwaldamnana Nanrantsouak (We Remember Norridgewock). Runners and canoeists make there way there for the event. Gedakina works to strengthen and maintain the connectedness among the generations of Native People in the region. Good morning from Vermont! I was pleased to find this post, and your blog, today while on a WordPress search for mentions of the Abenaki. I am on a personal quest in my corner of New England (Brattleboro, on the Connecticut River and the Massachusetts/New Hampshire borders) to learn of the people who were here before me. For thousands of years, and especially for the extended period before European contact, the Sokoki band of the western Abenaki lived and died here, and are now ignored and nearly forgotten. I seek to understand who they were (and still are) and how they saw this land, and lived within it. I appreciate your respectful experience of the Norridgewocks, or Kennebecs as they are known occasionally, a band of the Eastern Wabanaki, in your own area. The dwelling places of the Sokoki are all around me – I can recognize some of the places which they would have enjoyed, but they are being destroyed slowly, mostly through ignorance but also because of our cultural carelessness. I would like to know the provenance of the rephrased Goethe quote to which you refer on your About page: “How do you know where you are in the world if you don’t know who and what has been there before you?” This is how I feel as well and I’d like to explore the idea a little bit more to give it a deeper foundation. Can you tell me from where you derived your guiding tenet, through the mentoring of your high school teacher? Hi Rich! Thanks for your post! Regarding the Goethe reference. My high school German teacher was amazing & she taught us so well. The one quote I have always lived by is “Wer fremde Sprachen nicht kennt, weiß nichts von seiner eigenen.” Or, in English,”He who does not know foreign lanquages, knows nothing of their own.” I shaped this quote into the one I posted in my blog. I felt this need to learn about what had come to the river before I did during the entire experience I had while exploring the Kennebec River for my pinhole camera project. I have only touched the tip of the iceberg in what I learned this past year. Which is good, because it means I can keep going back to the special places and learn more each time. I’m reading a history book that talks about world events from 1815-1830. That period of time was the most ferocious in the decimation of Native People all around the world. It’s a horrifying tale. What’s even more horrifying is that, in this country, our leaders put the person responsible for the most intense carnage of this period right smack in the middle of the twenty dollar bill. 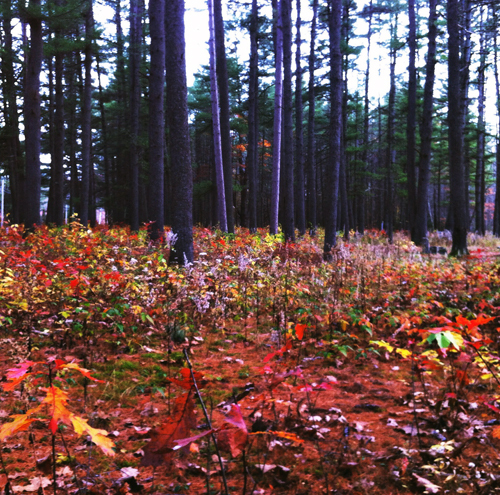 The Wabanaki people in Maine are working very hard to keep things alive. There is currently a legal battle because the state of Maine decided to change some language in some treaties and now are poised to sell off islands in the Penobscot River which belong to the Native people there. And I hope to get to the annual gathering back at Nanrantsouak this upcoming August. I’m going to round up some plastic buckets and will try to clean up the broken beer bottles and garbage that is strewn along the shore there. It’s one of the things that really stands out from my Kennebec River project. How much garbage people throw into the river. I lived in West Braintree Vermont as a youngster and spent every green-grassed moment barefoot running through the woods and in the streams. Thank you again for your comment and for sharing with me what you have learned about the Abenaki in your area! Thank you Johanna for the tips and explanations and help with the Goethe quote. It’s a good one and I will absorb it into my mindset. Yes, Jackson’s Indian Removal Act was/is one of the darkest blots in a sometimes unspoken but often overt campaign to disenfranchise the First People from their homes: the hills and valleys, rivers and forests. They were one and the same. Separated from it, their cultures became hollow and lonely. Sometimes it seems to me that the spirit is gone from the land. I want to look for it, because I know it is still here and that the Dawn People are still mindful. It’s a better place in which to be. Reblogged this on Abenaki Heritage Weekend .